I have to start off by telling you that I love HGTV. I love the HGTV shows, website, and the home giveaways. I enter every single HGTV home sweepstakes, every day that they are open for entries! I love looking at the HGTV home photos for design inspiration. I also like to see what products they are using because I trust that HGTV smart home products are the best products out there. 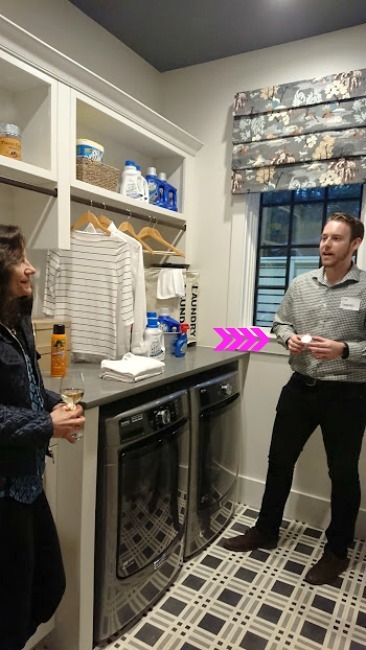 So naturally, when I was invited by SimpliSafe, one of the sponsors of this year’s Smart Home, to get a sneak peek at the 2018 HGTV Smart Home, I was super duper excited to get to tour the home and learn more about the wireless home security system that protects it. Disclosure: SimpliSafe did provide travel to the 2018 HGTV Smart Home. I received no monetary compensation and all opinions expressed are my own. 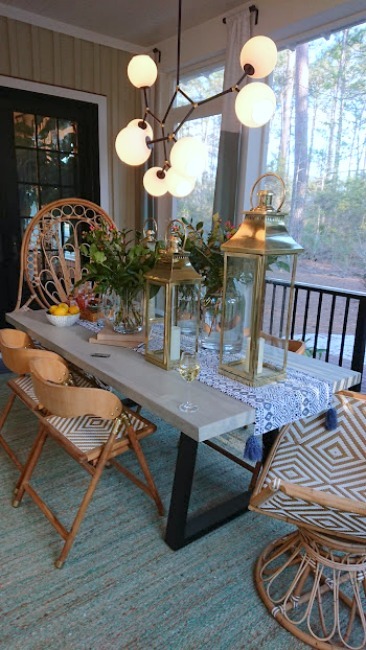 To begin with, this year’s beautiful HGTV Smart Home is located in Bluffton, South Carolina. It is located in a private community and the idyllic, picturesque surroundings create a perfect oasis retreat. 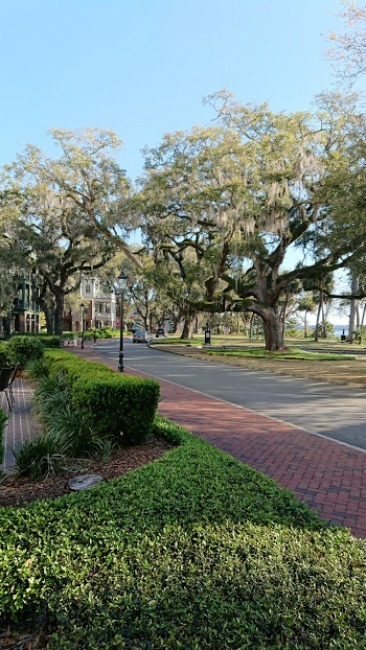 The house is surrounded by live oaks and palmettos and it is so inviting, right down to the front porch swing! As you are walking to the front door, you pass a SimpliSafe Yard Sign letting you know that the home is protected and monitored 24/7 by SimpliSafe. The SimpliSafe base station is also located within view when you walk in the door on the sofa table but you probably wouldn’t notice it. 2018 HGTV smart home living room. Can you spot the SimpliSafe base station? The large open concept kitchen was just gorgeous. The beadboard panel cabinets were large and functional as well as a real style and color statement. All of the appliances were high end and there was an integrated TV cabinet door above a stainless microwave. I also loved the outdoor screened in porch. So lovely! How about this master bedroom? Equipped with a small panic button by the bedside for added peace of mind. 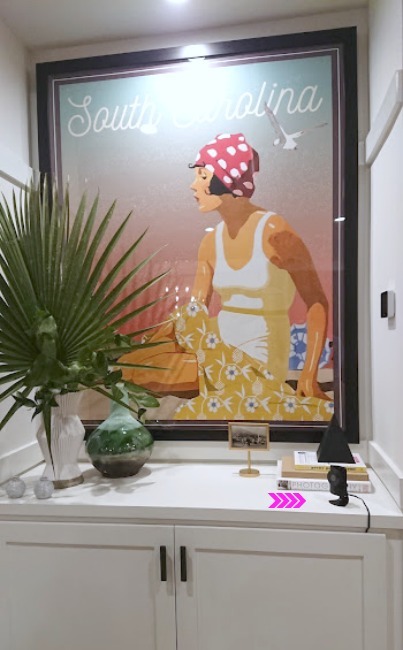 As I toured the 2018 HGTV smart home, I was impressed by the beautiful, lavish decor and the smart home products. 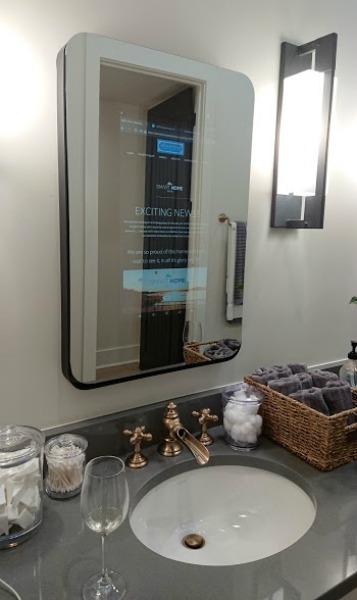 There were smart home technology features that kind of blew my mind like bathroom mirrors with internet access and showers with TVs. 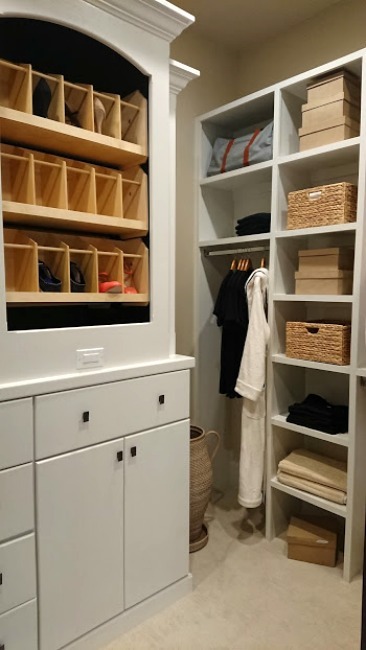 There were also smart home products that I wanted to take home with me to my house and that seemed totally necessary like the shoe carousel in the master closet, the built-in coffee system by Jenn-Air in the kitchen cabinetry, and the SimpleSafe wireless home security system! 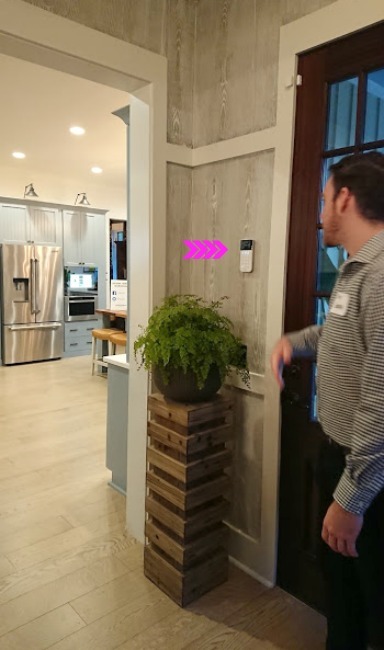 As I toured the 2018 HGTV Smart Home I honestly barely noticed the SimpliSafe Wireless Home Security System. 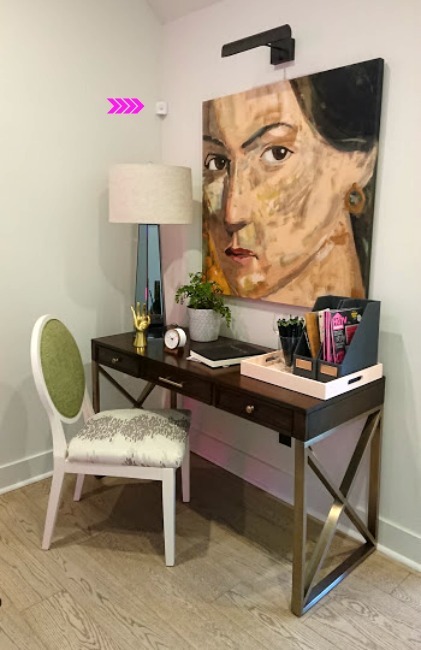 I mean the control panel by the front door was fairly obvious but the other home security features such as the motion detectors, wireless home security cameras, panic button, and wireless sensors just blended in with the home decor in a very non obtrusive way. Discreet motion detectors are part of the complete home security system. I didn’t notice most of the SimpliSafe hardware until the tour where SimpliSafe pointed it out. That appealed to me both from a visual perspective and from protection perspective. They even have sensors for things like water, freezing, and smoke so you can be sure this home security surveillance system protects you fully. He is holding the tiny water sensor in his hand and just places it under the washer to help keep the home protected. 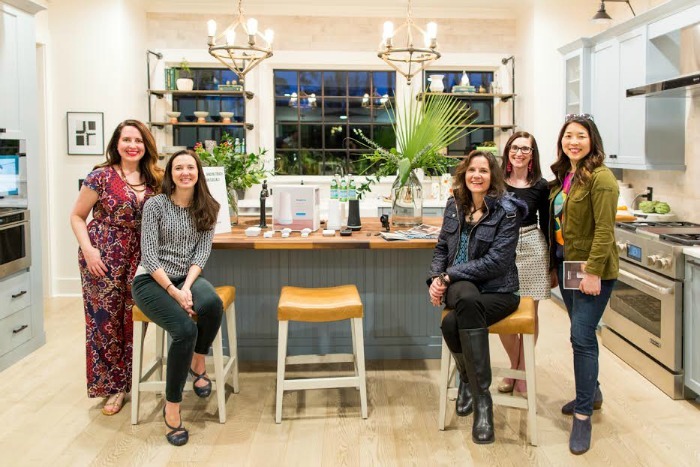 If you think like I do, you are probably thinking, “HGTV smart home products are bound to awesome, but is SimpliSafe affordable?” Well, I was really impressed to learn that SimpliSafe is affordable. You get 24/7 professional monitoring for just $14.99/month with no long-term contracts! It is no wonder that SimpliSafe protects over two million Americans with their easy-to-use, award-winning home security. Next, you may be wondering about home security system set up. Well, I love their answer to that too. 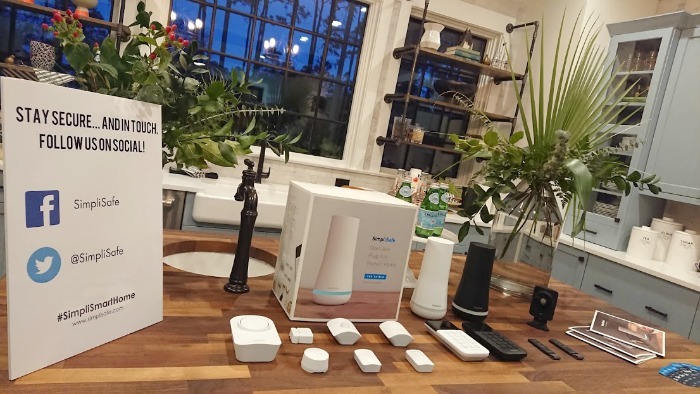 Anyone can buy a preconfigured SimpliSafe Wireless Home Security System and set it up right out of the box in just a few minutes. Yup! Because there is no drilling or tools needed, you can just plug in the base station, place your sensors, and use command sticks to mount your wireless keypad and start protecting your home right away. Visit simplisafe.com to learn more. SimpliSafe home security system keypad is easy to install, perfect for those that prefer DIY. 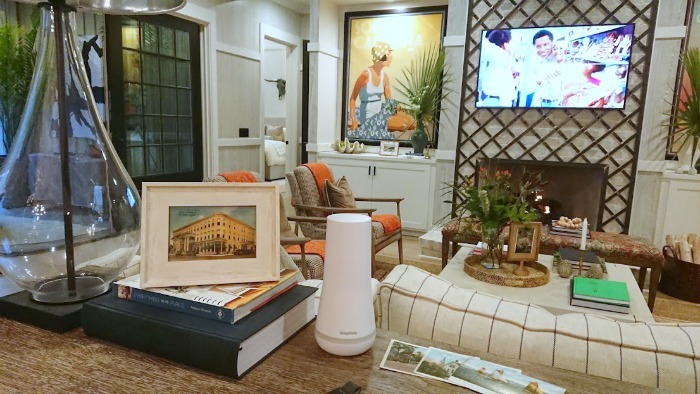 The SimpliSafe Wireless Home Security System in the 2018 HGTV Smart Home is the third generation of SimpliSafe’s home security system. It is more intuitive to use than ever. Later this year, SimpliSafe will release a video doorbell, outdoor cameras and a smart lock, making SimpliSafe the most comprehensive wireless home security platform. Do you have any questions about the SimpliSafe Wireless Home Security System? What appeals to you most home security surveillance systems?